Costco’s uncooked flour tortillas are a staple in the Haslem home. We use them when we make tacos, flautas, chimichangas, spicy chicken wraps, and we LOVE using them for quesadillas! I wanted to add some pizazz to the traditional cheese or chicken quesadilla and the result was delicious! You all really need to give this one a try! Coat the shredded chicken in a few tablespoons of BBQ sauce. Lightly cook tortillas (if using the uncooked ones). Sprinkle a thin layer of cheese on tortilla. On only one half of the tortilla, sprinkle apple slices, bacon bits, and shredded chicken. Sprinkle more cheese on top. Fold in half and cook until lightly browned. Serve with a side of BBQ sauce! 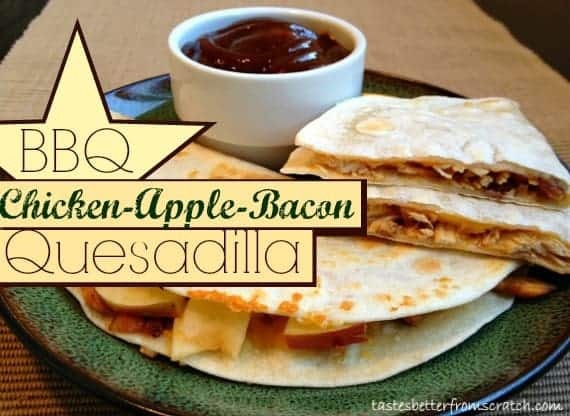 I love quesadillas because they are so easy. These look fantastic and I can’t wait to try them! Thanks for sharing at Showcase Your Talent Thursday. I pinned this and will be sharing on Facebook. Thanks so much Alyssa! We really appreciate the support! Just curious, did you just cook the chicken on the stove or in the oven? I cooked it on the stove but you could definitely cook it in the oven if you would like! @Lauren H.